What a fantastic show of color and flair for the autumn landscape! Our fall-flowering Nerine Mix exotic trumpet-shaped blooms with flamboyant wavy edges in a blend comprised of pink, red-pink and white. These lovely yet unusual flowers have a faint musky fragrance that is rare in fall-blooming varieties. 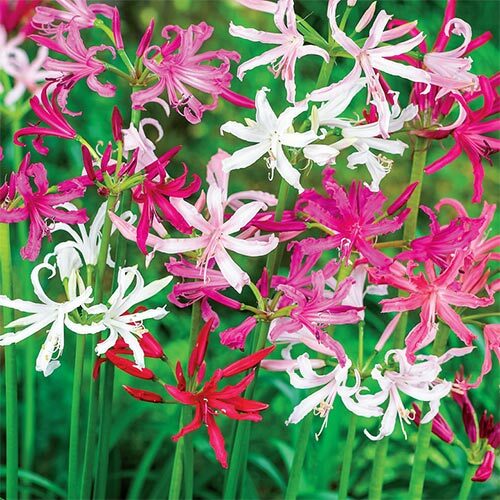 Nerine are easy to grow, requiring only well-drained soil and a full sun spot in which to thrive. Planted in groups, this mix brightens up even the dullest of borders, pots and beds. The showy blossoms grow atop tall, straplike stems, giving them a very graceful appearance. Lift in fall in zones 3-6. Lift in fall if you live in zones 3-6 for winter storage. Replant the following spring after frosts are over.